My kids and I are big fans of the Food Network, and especially Chopped, which features four chefs who are each given identical baskets of (often strange) ingredients and asked to compose beautiful and tasty dishes in 20 to 30 minutes. For someone like me with limited cooking skills and even less passion for culinary arts like ‘developing flavors’ it’s fascinating to watch such talented and creative individuals make something amazing from ingredients I’ve never even heard of. Chopped only works because at the beginning of each round every contestant receives the exact same ingredients with which to work. Likewise in 21st Century schools, all educators are obligated to work within the framework of standards to ensure that every student has the knowledge and skills to succeed. Within the standards ‘basket’ from which all educators work, there are three specific ingredients that Fort Osage teachers must consider in their ‘cooking’. Standards-Based Grading and Reporting: While the transition to the new gradebook has certainly presented challenges for teachers this fall (kind of like the bony fish on Chopped…) our district practice of recording grades aligned to standards and reporting standards performance to parents is a cornerstone of our district culture. The switch to the eSchool gradebook and assessment system has not gone as smoothly as anyone would like, but since Pinnacle eliminated the product we’ve used for many years we had no choice but to change. While the switch has been rocky in some ways, we are confident that the system will be fully functional in the near future. At the end of the day our grading ‘ingredient’ ensures that teachers have a better grasp on the standards you’re teaching, and our students and parents have a clear understanding of strengths and challenges. Scoring Scales: The latest improvement to our standards-based system are the scoring scales being rolled out this year for core areas and developed for electives. The scales serve several important roles in our ‘dish’ including more specific descriptions of the skills needed to master the standards, an effective communication tool to use with parents and students, and a clearer explanation of the 4-3-2-1 ‘grading’ scale than our current percentage conversion chart. As we work to meet the rigorous expectations outlined in the Missouri Learning Standards, teachers and students will both benefit from unpacking the standards into scoring scales because it helps to ensure that everyone is on the same page regarding expectations and the knowledge and skills needed to succeed. State Assessments: Of course another element in our basket, that’s also in the baskets of every district in the nation, is the state assessment system to which we are all accountable. While our ultimate goal is always to effectively educate our students, we can’t deny the importance of these assessments to our accreditation and therefore our viability as an institution. As the assessments evolve along with the standards in Missouri, we will need to pay close attention to this ‘ingredient’ to ensure that our dish effectively integrates it to best prepare our students for success. What Are Our Chefs’ Tools of the Trade? If Fort Osage educators are the chefs facing the baskets described above, we are fortunate to have not only expertise, creativity and shared experience, but a number of important tools that each teacher uses to make the most of the ingredients. On Chopped, every chef uses kitchen tools like knives, bowls and food processors. The contestants also use appliances, especially the stove and oven, to develop their culinary creations. Finally, as host Ted Allen points out in every episode, the chefs have access to the show’s pantry and refrigerator, from which they can add a wide variety of other ingredients to their dishes. We have comparable resources in Fort Osage, and our teachers use them daily to achieve the best outcomes for students. Technology: Rather than knives and food processors, Fort Osage teachers work with technology to make the most of their ingredients. Through both teacher and student use of Chromebooks, Smartboards and other resources, educators are able to transform learning experiences for students. Whether it’s accessing and sharing information through Google Classroom, assigning research to broaden students’ understanding of the subject, or using a wide variety of internet resources and tools, there is no question that technology allows us to personalize learning to a greater extent than ever. Just as with the professional chef, as teachers become more comfortable and proficient with technology, the variety and quality of results will continue to improve. Student Support System: While this ‘appliance’ is utilized differently by teachers and schools throughout the district, another critical resource that every educator has access to is a system to support struggling students and to enrich those with more advanced skills. Just as a chef may need to ‘turn the heat up’ to get the most flavor from a particular ingredient, our student support system provides ways for teachers to collectively provide additional support for students at risk of falling behind. An important feature of this tool is that while it may be used differently at different times, the goal is always to achieve a high level of performance in the end, not merely to keep students from falling further behind. As with the other resources described in this section, the skilled educator learns over time how to use the support system in more effective and sophisticated ways to best meet the needs of each student he/she serves. Effective Instruction: The most important resource for the chefs on Chopped is all the other ingredients available for their use. How else to make goat brains or sea cucumbers tasty but to mix them carefully with more appetizing accompaniments? As the chefs on Chopped use their experience and creativity to choose the best ingredients to use for each dish, our teachers choose the instructional strategies that will be most effective in helping every student to reach their learning goals. Even more than I love to watch others cook, I love to see what teachers in different classrooms do to bring their learning objectives to life and ensure mastery among their students. Teachers are masterful in their use of learning activities, assignments and feedback that increases understanding, and the expertise and effort that goes into choosing just the right ‘ingredients’ pays off in student learning in the end. And What About the Judges? examination of their student data over time, as well as their collaborative effort to identify the strategies most likely to improve student learning, data teams allow teams of teachers to evaluate their own ‘dishes’ and to improve their outcomes significantly over time. Just as students grow significantly through feedback from their teachers, teachers themselves improve when they collectively and honestly evaluate the current reality of their students’ success and take deliberate and thoughtful steps to improve. This is the purpose of the data teams process. While it sometimes seems as though there are too many initiatives to be effectively maintained, each element described above is part of a coherent whole that helps our district to maximize student achievement. Teaching is a complicated task and it isn’t for the faint of heart, but one significant advantage of teachers in Fort Osage is that we can always rely on each other to support us and help us improve. Rather than competing against the chef at the next station, Fort Osage educators are working together to ensure the very best opportunities and outcomes for each of our students. Last week’s blog addressed the Depth of Knowledge framework and its importance in planning for instruction. As we work to use technology effectively, there’s another framework for educators that addresses their integration of technology. The acronym is TAR, and it signifies that teachers can Transform, Amplify or Replace traditional student work using technological tools. 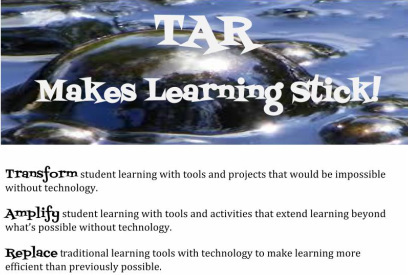 Just as we focus our attention more on the standards students are learning than the specific content we provide, the TAR model helps us to reframe our use of technology away from the apps or devices we’re using to the overall impact their implementation has on student learning. Technology is a tremendously powerful tool and it can impact learning when used in a wide variety of ways, but we will see the greatest benefit when we understand and plan for the most effective use in a given situation. Sometimes technology is truly transformative when it’s used to allow students to have learning experiences that are unimaginable without the technology tool. 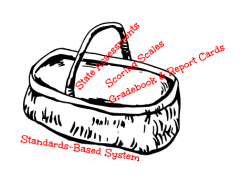 Examples of transformative uses include opportunities for students to collaborate with others across the country or globe to complete a project, accessing scientific data previously unavailable to conduct research, and using software and Web 2.0 tools that allow students to design, test and build things that would be impossible without technology. These opportunities are engaging for students and represent the greatest powers of technology. At other times, technology can be used very effectively to amplify the power of traditional learning. When students use internet search tools to identify multiple primary sources of information, or use Google forms to administer a survey or to take a quiz that can be graded automatically, or when they use a blog to communicate their ideas more widely than traditionally possible, technology is amplifying what was previously possible through increased reach, communication and efficiency. Finally, it is perfectly acceptable to use technology as a tool that replaces traditional classroom activities. For instance when students answer questions or write an essay in a Google Doc, or drill math facts with an iPad app, or look up a definition using Google instead of a dictionary, that’s a replacement strategy. While this is the simplest way to integrate technology, that does not mean that it’s inherently inferior to the other two. The value of technology implementation is in the THINKING it promotes in students, not in the novelty or sophistication of the technology task. For this reason, we are overlaying the DOK levels with technology integration strategies to give teachers a means to evaluate the two systems simultaneously. The Thinglink below shows several examples of technology integration in high school ELA that fall at a variety of DOK and TAR levels. Just because an assignment is a transformative use of technology doesn’t mean that it’s a high DOK level, and vice versa. Teachers need to carefully consider the standard, the instructional DOK level that will lead to student understanding and the technology tools and expectations that fit most effectively with the overall plan. Bigger isn’t always better. Throughout the year teachers will have the opportunity to work with both building technology coaches and instructional coaches, as well as through content teams, to explore the interactions between DOK and TAR and to make plans for how you can teach standards in the ways that lead to the most significant student learning. As we begin a new year with the goal of ‘transforming together’ we each need to be thinking about the expectations we have for students as thinkers in our classrooms. As a way to consider these expectations, I’m going to refer back to the Depth of Knowledge (DOK) framework that’s been used in Missouri for many years. Just like Bloom’s before it, the DOK framework has gotten simplified to a list of verbs, rather than considered as an overall way to view student learning. Thinking of DOK as a bullseye, rather than quadrants of a wheel as it’s often seen, helps to show how the levels relate to each other. Standards and learning targets at a DOK 1 have only one simple answer. So 7x5=35 is DOK 1 information that can applied at DOK 2 to a story problem such as: Five friends each bring seven pencils to school on the first day. How many pencils do they have all together? This is DOK 2 because learners not only have to know that 7x5=35, they have to be able to reason through the sentence to determine that it’s a multiplication problem. Ultimately, standards that fall in DOK 1 or DOK 2 almost always have a single correct answer, whereas DOK 3 and 4 cause learners to stretch their thinking, solve problems in novel ways, and perhaps come to different conclusions on the same task. For instance, asking five students to use 35 pencils to build a tower that will sustain its own weight for five minutes is a DOK 3 task (albeit more physics and engineering than math). A DOK 4 project might ask those students to research how the tallest towers are built a design the ideal skyscraper based on what they learn. In order to be successful with DOK 3 and 4 level tasks, students have to possess DOK 1 and 2 knowledge and skills. HOWEVER, this doesn’t mean that students must be taught everything at DOK 1 and 2 before they are prepared to face more advanced tasks. Learning through discovery can be an extremely powerful strategy to help students master information and skills. Opportunities like the tower-building activity provide students with much more authentic experiences with skills and concepts, and a great means to teach the vocabulary and basic information that are important in every discipline. So, this is your first challenge in our ‘Transform Together’ year. Try strategies and activities that TEACH a standard at a HIGHER DOK level than is required by the target itself. Our new math elementary series emphasizes teaching multiple strategies (DOK 2) to help students acquire DOK 1 level knowledge. The same technique can be applied across all content areas by providing students opportunities to stretch their thinking and solve problems throughout instruction, rather than just at the end of a unit. Try it!... and share what you’re doing and how it’s working on our new Google+ Transform Together community.